Dr. José Xavier from the Institute of Marine Research of the University of Coimbra in Portugal, and the British Antarctic Survey in UK, has conducted research on the predator-prey dynamics that sustain populations of albatrosses, penguins and other top predators in the Southern Ocean. He has published a comprehensive monograph on the prey of top predators that will be a great aid to many researchers. In addition to his scientific research, he played a leading role in the establishment of a new and thriving Antarctic research programme in Portugal, ProPolar, during the International Polar Year (IPY, 2007-2008) and in launching a highly successful educational programme, LATITUDE 60! during the International Polar Year (IPY) 2007-2008. In September 2011, he became the youngest recipient of the prestigious Martha T. Muse Prize for Science and Policy in Antarctica. You are from Portugal, a country without a long tradition of polar research. How did you become a polar biologist? As an undergraduate student in Portugal, I became very interested in marine science, particularly cephalopods (squid and octopods). One of my professors asked a colleague, Professor Paul Rodhouse of the British Antarctic Survey in Cambridge to do an undergraduate thesis on cephalopods with him in 1997. 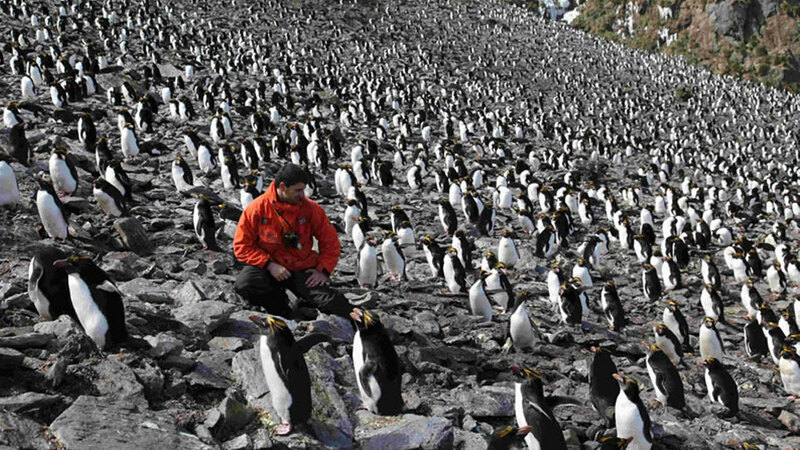 And as it turns out, Paul is a world specialist on Antarctic cephalopods… That´s how everything started. After that, I did my PhD at the University of Cambridge, my post-doc at the British Antarctic Survey, and now I am working at the Institute of Marine Research of the University of Coimbra in Portugal, but am still closely associated with the British Antarctic Survey. You have just been awarded the very prestigious 2011 Martha T. Muse Prize for Science in Policy in Antarctica, for both your scientific work and your contribution to education and outreach. Did it come as a surprise? What does it feel like being the youngest recipient so far, and how do you think it will impact your career? It came as a surprise because this is a very prestigious and competitive award. Many other scientists from all areas of polar science - and mostly from countries with far more experience in polar science than Portugal - were also in the running. I was very happy when colleagues thought of nominating me, but I never thought I would actually win. Winning was like a dream; but I hope it also serves as an inspiration to other scientists in the middle or early stages of their careers. It shows that excellent science, education and outreach, and policy work can be done in parallel by early/mid career scientists - and with brilliant results. The rise of polar science in Portugal has been a success story over the past five years. During the International Polar Year (IPY), the Portuguese polar community created both a scientific and an educational programme, joined the Association of Polar Early Career Scientists, the Scientific Committee for Antarctic Research , the European Polar Board, the sub-committee of the IPY for Education and Outreach, as well as signing the Antarctic Treaty. What’s more, our scientists have joined major scientific programmes, such as ICED (Integrating Climate and Ecosystem Dynamics) or EBA (Evolution and Biodiversity in Antarctica) as well as a number of expert research groups. As an early career scientist during the IPY, I was involved in just about everything. I was pursuing my science on top predators ecology and food webs dynamics, but also highly engaged in education and outreach nationally and internationally, engaging politicians, doing fieldwork (spending 9 months in Antarctica in 2009), going to conferences... It was an extremely busy time for my Portuguese colleagues and I, and it continues to be busy today. I love what I do, regardless, but receiving such an award makes all that hard work all the more worthwhile, especially when it means spending a lot of time abroad away from family and friends. It shows that the polar community recognized the importance of our work, and that makes me really happy! I hope it has a very positive impact on my career, but also on the Portuguese polar community as a whole. The work we have done during the International Polar Year was amazing, but we still have lots to do. Starting with science, can you tell us about your research in predator-prey dynamics? With this work, I am studying how the Southern Ocean actually functions. In particular how top predators (particularly albatrosses, penguins and seals) are adapting (or not) to climate change. Assessing the abundance and availability of prey such as krill, fish and squid in the Southern Ocean, and tracking top predators to know where they go, what they eat, and how they eat it, is essential. My studies have direct implications on top predator conservation, fisheries assessment and on the establishment of monitoring programmes. Are you involved in any other biological research in the polar oceans? Yes. My research in the Southern Ocean is interdisciplinary, involving physical oceanographers, marine biologists, chemistry experts and climate experts. Furthermore, it brings together a huge group of Antarctic researchers from numerous countries, perpetuating the spirit of polar research and exploration over the last decades. You have also just lead the publication of a monograph on the prey of top predators in the Southern Ocean. Can you tell us a little more about this publication, and why it’s important? The "Cephalopod beak guide for the Southern Ocean" is a book that the Antarctic researchers working on the diets of predators have been waiting for for a very long time. That’s why, as a project, it was endorsed by the IPY and other international research organizations. Today, if a researcher needs to look at the diet of penguins, seals, whales, or albatrosses, he or she will need this book. Cephalopod beaks are incredibly hard to identify, which this is why we have worked really hard for three years to produce a book that provides all the valuable information needed to identify the main cephalopod beaks. We can even provide 3-D visualization. Thanks in part to your efforts, for the past few years, Portugal has become much more active in the field of polar research. Can you describe this process? How much further is there to go? Before the IPY, there was no national Portuguese polar programme and most Portuguese scientists were integrated within the programmes of other countries active in the Polar Regions. For example, my own research started in 1997; but until 2004, it was identified as British for copyright and other reasons, as this was the country with which I was collaborating. What fields of polar research is Portugal focusing on more specifically? Why? The main polar research areas are the marine sciences, the terrestrial sciences, atmospheric sciences, planetary sciences, and most recently the social sciences. These fields are the reflection of where Portuguese polar scientists are competitive at an international level, and thus invited to collaborate with other countries. Which national Portuguese institutions are playing the biggest role in this research? The two major research groups in Portugal are the Institute of Marine Research of the University of Coimbra - my group - and the Centre of Geographical Studies (CEG-IGOT) of the University of Lisbon - Gonçalo Vieira’s group. These are probably the two most active ones, but there are as many as thirteen other groups that are becoming more and more active, which is brilliant to see. What countries is Portugal collaborating with most actively in the field of polar research? And on what projects specifically? Portugal collaborates with numerous countries worldwide, but strategically speaking, there are three countries with which it makes particular sense to strengthen our collaborations. The first is Brazil, due to the mutual cultural and historical links, including our language. The second is Spain, as they are our closest neighbour and also involved in polar science. Collaborations with Spain are already producing good results. And the third country is the United Kingdom. This is because they are extremely productive scientifically, we have been collaborating with them for the longest time, and it is one of the strongest nations in terms of polar logistics. How much money is Portugal is spending on polar research, and where is the money coming from? Is the current economic crisis a worry for you? Portugal does not attribute funds specifically to polar research. All research groups have to apply for funds in polls within their research areas at the Foundation for Science and Technology (FCT). Thanks to the quality of our research, however, some polar projects were funded, and we were able to bring them together and create a "polar programme". In total, we have managed to collect €1.2 million in both public and private funding. Of course, the current economic crisis does worry me. I feel the solution is to strengthen our collaborations with key countries, so that we can maximize the usage of logistics while reducing the costs. For me, the key words today should be “interdisciplinary research” and “international collaboration”. You are very involved in polar science education and outreach in Portugal and elsewhere. Can you tell what is Latitude 60? Latitude60! was a Portuguese IPY polar education programme that involved more than 35,000 people directly, and touched many thousands more indirectly, from toddlers all the way to elderly people. It was coordinated by the Centre of Geographical Studies (CEG) of the University of Lisbon, the Centre of Marine Sciences of the University of Algarve, and the Association of Geography teachers. It produced more than 40 activities in order to reach the general public and politicians, and worked directly with schools, including teachers, educators, and students. The most important events organized by Latitude60! were a national competition that took seven winning high school students on an Antarctic expedition; polar science exhibitions in shopping centers; braille cards; TV clips; blogs and websites; books; skype calls from the field; expeditions to the Portuguese mountains (to allow students compare phenomenon in Portugal and in the Polar regions); theatre plays; school talks; and many more. It was later considered to be a case study in the success of IPY. For the scientists involved in it, it represented a lot of hard work and time spent away from research, but it also helped us become better scientists, and put Portugal up there with the most active nations during IPY. Why, as a working scientist with purely scientific ambitions, did you feel the need to devote so much time to outreach? How easy or difficult has it been to combine the two? For polar science to succeed in Portugal, it was fundamental to engage the general public and politicians. Therefore, creating an education and outreach programme was essential. Having a great number of early career scientists in Portugal, with an age that the younger generations could easily relate to, and having the support of mentors and school teachers, made our work much easier. Like numerous other scientists in Portugal, I love education and outreach. Indeed, it helped me become a much better communicator. The hardest aspect of combining science with education and outreach was managing the time available. As a scientist, there is a constant pressure to publish my next paper, but on the other hand, as we are paid by the tax payer, it is also our role to let society know what we do. Plus, doing events and activities with schools and the general public is truly rewarding. I don’t think I will ever stop going to schools to show why polar science is important to our planet! José Xavier is a principal investigator at the Institute of Marine Research of the University of Coimbra in Portual and at the British Antarctic Survey in the UK, collaborating with researchers from more than 15 countries worldwide. One of the co-founders of the Association of Polar Early Career Scientists (APECS), Dr. Xavier was a member of the Education and Outreach sub-committee during the International Polar Year (IPY) 2007)2008 and the youngest person to receive the prestigious Martha T. Muse Prize for Science and Policy in Antarctica. He has also been involved with the Portuguese national research program ProPolar and the educational program LATITUDE60!